"Reunited, and it feels so goooooooooood....."
This is how I feel at this very second. I've missed you guys terribly. In case you were wondering, the move went great. Awesome, actually. If there is any benefit to having a husband in the ministry, it's the amount of helping hands available when you move. Anyway, I've been meaning to ask you, why is it so hot outside? I'm not okay with it. I'm a little afraid of what the summer holds if the spring is this intense. So in light of us moving (and because it's hotter than dickens outside), I threw together a fun little smoothie. Not a serious smoothie. It's not the kind you'd take home to your mother. It's the kind that you take on one or two dates, then realize that long-term, you want to find a serious smoothie. I repeat: this is not a serious smoothie. I understand that I'm sending conflicting messages about this. Let me clarify: this is a dang good smoothie. But it's so simple, it's hard to take it seriously. Real smoothies have health-beneficial powders, 7 different types of fruit, trendy names like "Cabana Banana" and cost $9 at Smoothie King. This estimated $2 smoothie (for 2 large servings) can't possibly be the real thing. I'll leave it at this: my husband, who is the pickiest eater alive, has completely finished his. In under 6 minutes. Because it's a good stinkin' smoothie. He compared it to a strawberry eclaire. Come to think of it, this would be perfect for an after-school snack that's not packed full of calories (wouldn't want to spoil any appetites). It would also be great for an outdoor summer get-together. But I'm not going to tell you how to live your life. I just offer great suggestions like this one. Blend all ingredients together. Serve with a strawberry as garnish. Yum! My mom makes a smoothie just like this but with water instead of milk because she's lactose intolerant! I love it! Its not nasty cuz i just made it and its delisious!! THANKS SOOOOOOOO MUCH!!!!!!!!! all the other recipes i looked at required yogurt or ice cream and i saw this and just about had a heart attack! thanks! Just made one but instead of regular milk I used soy milk! Delicious! My 14 year old son loves homemade smoothies! He made his first last night using your recipe! He was so proud of himself. He made extra for me and it was delicious! Oh, and I am a California girl transplant too! Our son was born in NC. Yuuummmmmmmmmmmmmmyyy!! 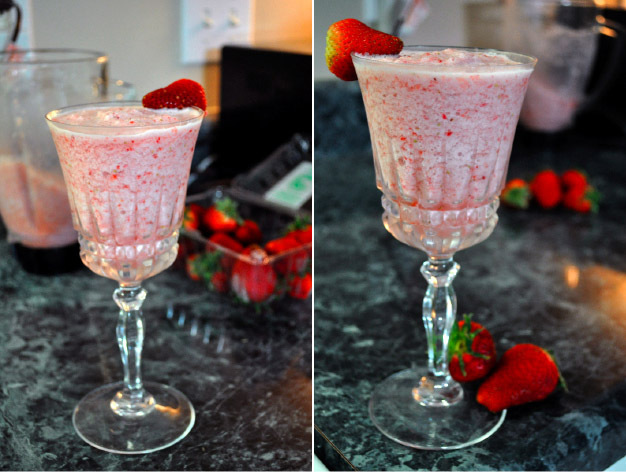 Just made this for me and my grandson...used strawberry milk as well as the strawberries.....we usually get the powder mix thingy at the grocery store...but didn't have one so googled for a smoothie recipe without yogurt....didn't have any of that on hand! Thanks so much!! Comments look nice so let me try it and the blog it !